Since this product appeared, it’s been much easier and more straightforward dealing with cases of stress incontinence among my women patients. They find it an easy and very acceptable way to get rid of their embarrassing symptoms. I’m really happy with this. I’m 49 with four children, and going through menopause. My pelvic floor was getting worse every day and I tried a lot of the exercises recommended, but despite that I had to start using pads every day. I’ve now used the cones for just under two months and things have changed completely! No more pads and I feel confident in any situation again. It’s discreet, and easy to carry around with me, and I’m using the cones every day to make sure I stay this way. When I finally admitted to myself that I had a problem I started to look for an answer. There are so many products, all of them promising great results, and it was hard to decide between them. I told my gynaecologist I preferred to avoid surgery and he recommended that I use this product. He told me that safety was the most important thing and that this one had been clinically tested. It’s literally changed my life. I can do lots of things now which had become almost impossible just a few months ago, and it hasn’t been difficult at all. I thoroughly recommend this for all women. Running has been my life and I had to give it up because of my pelvic floor. I’ve tried the cones for some weeks and I’m feeling so much stronger. I’m taking things carefully for now, but I’ve been able to get back to my running. Really helped me. Training with vaginal cones produced significantly better pelvic floor muscle strength than did exercise without cones. We also find it worthwhile to consider pelvic floor muscle physiotherapy with vaginal cones, most probably useful for the prevention of utero-vaginal prolapse, urinary incontinence, and as an aid to sexual satisfaction. 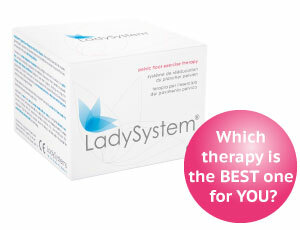 LadySystem was first conceived over 20 years ago to answer a need among millions of women for a solution to their pelvic floor problems. The product was designed under the guidance of women like you, and has been continually improved over the years to reflect what our users told us they wanted. Your story could also help new users to get to know about LadySystem, and to find out how it can help them to solve their problems. So thank you for taking the time to tell us about your experience.